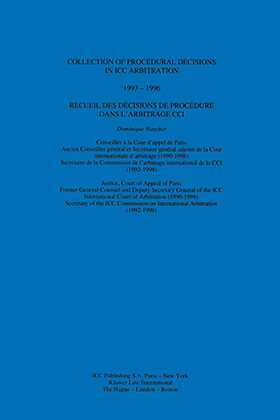 The Collection of Procedural Decisions in ICC Arbitration 1993-1996 contains the procedural decisions rendered by ICC arbitrators, published in a single volume for the first time. In addition to providing procedural decisions in their original language, this book includes commentaries on the decisions, key words in both English and French, and explanatory notes of interest in English. Two useful indexes guide the reader to points of specific interest. The analytical index, provided in both English and French, is based on terminology used in decisions and case notes, while the table of cross-referenced cases provides citations to the Journal du Droit International. A bibliography and tables containing the judicial and arbitral authorities cited provide useful reference information. The collection also includes the ICC and UNCITRAL Arbitration Rules, as well as the IBA Rules on Evidence, providing the reader with the full range of materials regarding the conduct of international arbitration. This collection is an indispensable reference work for anyone seeking to be informed about the conduct of international arbitration. Invaluable for all international arbitration practitioners, this book offers the reader solutions to pitfalls in arbitration proceedings by the most talented international arbitrators.